In December 2011, I received a call from Bill Richards in Beaumont requesting a sidewalk counseling training. Eileen Romano, Director of the 40 Days for Life-Beaumont campaign, had kept vigil outside the Whole Woman’s Health abortion center faithfully, many times alone. But Bill and Eileen wanted structure and training to help save lives. In February of the next year, I flew to Beaumont, where I was met by Bill and his wife. I visited the Whole Woman’s Health abortion center where they concentrated their prayers. On Saturday, I presented the Monsignor Riley method of sidewalk counseling to about 45 people at Our Lady of Lourdes Catholic Church. The group was very receptive and had many questions. It was their first sidewalk counseling training. Following the training I was a guest speaker for their 40 Days for Life rally. Rally speakers included Beaumont Bishop Curtis J. Guilloy and Dr. David Darbonne, a Catholic OB/GYN from Sulphur Springs. Others gave poetry readings and sang pro-life songs. It was a rousing night for life with about 60 people attending, and a kickoff to a new era of prayer and counseling in Beaumont. Everybody wants you back or to go see you. . . . Your input was phenomenal! We have had eight saves and four possible turnaways for this campaign. . . . I can’t tell you how many have raved about your visit. So, I thank you so much. You were a shot in the arm for all of us and our inexperience. You gave us new confidence and for the reluctant ‘new courage.’ God bless you. I was so blessed to participate in God’s plan in Beaumont. And He was not done. 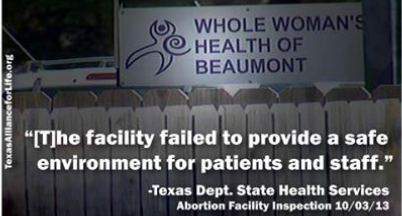 On October 3, 2013, Whole Woman’s Health received a notice from the state, outlining a number of regulation failures endangering the facility’s patients. And in spring of this year, the facility closed its doors, blaming the new regulations in omnibus pro-life law HB 2. On April 12, CPLC Executive Director Karen Garnett and I were thrilled to attend the closing ceremony at this facility, ensuring no more precious lives would be lost to abortion in Beaumont. God be praised!